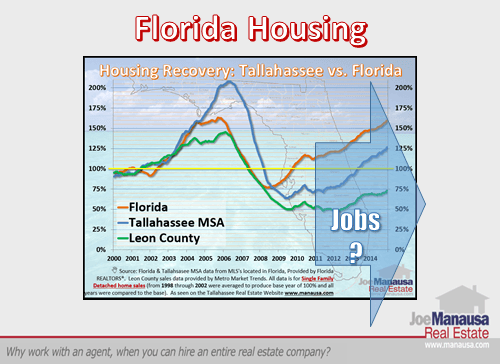 I was invited to speak at the Tallahassee Builders Association yesterday to provide my perspective and outlook for the Tallahassee area real estate market in 2015 with emphasis on what I see for new homes. The discussion seemed to go well, and there was good give and take Q&A after the formal presentation. Afterwards, I promised to post my content online to make it available for TBA members to review. What a better way to do that than in a summary on the Tallahassee Real Estate Blog? The following slide show is what was presented to the Tallahassee Builders Association at yesterday's luncheon. Explanations for each slide follows below. In order to orient a group of people to current market conditions, we need to have a basis from which to compare. This baseline is shown as a yellow line on the graph below, and we can observe how each of the chosen market areas has performed in comparison to this basis for the past 15 years. Florida (Orange Line) - Florida is recording monthly home sales at nearly the same rate as it did when the market peaked in 2005. Currently, unit sales are 98.2% of that peak value and 60% higher than the baseline. 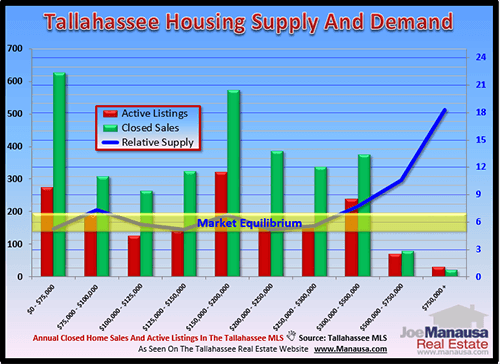 Tallahassee MSA (Blue Line) - The Tallahassee MSA is well behind the rest of Florida, with sales currently running at 61% of the level that was recorded at the peak of the housing market. 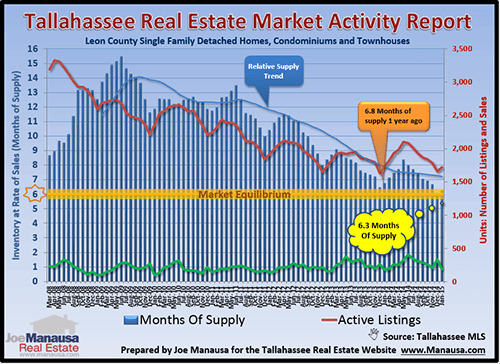 Currently, the number of homes sold is 27% above the baseline, meaning the Tallahassee MSA is averaging more homes sold each month now than it did from 1998 through 2002. 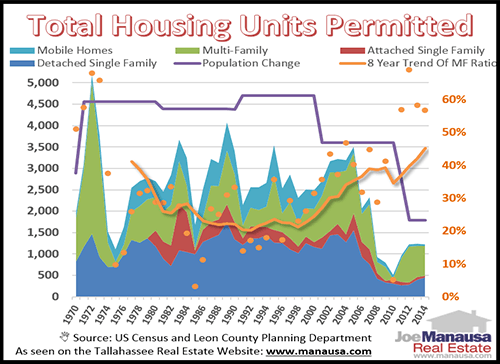 Leon County (Green Line) - Leon County, Florida is the Tallahassee real estate market, and not many homes are selling. Currently, monthly home sales are running at 51% of the rate of the peak of the market, and only 75% of the level of the baseline. The graph above shows that the current number of monthly home sales is consistent with levels recorded in 1991 (and Leon County was 43% less populated back then). 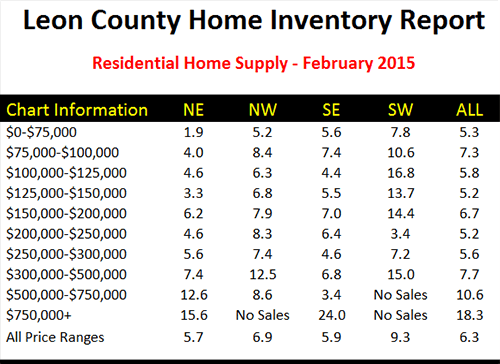 Additionally, roughly 9% of homes sold in Leon County right now are new construction. Why Is Buyer Activity So Low? So where are the Tallahassee buyers? Historically, buyers come from three sources. 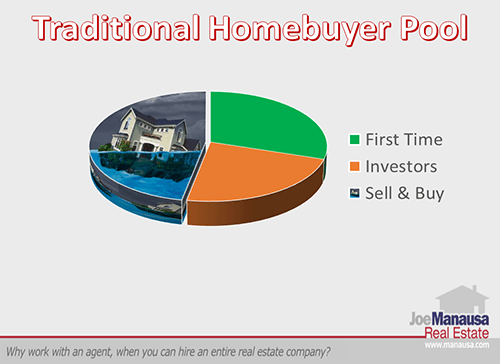 First time buyers (somebody who has not owned a home in the past 3 years) and investors (people who purchase homes for the purpose of leasing to others) comprise a little more than half the market, while the rest of the buyer pool is populated by people who first have a home to sell. This group has people who want to move right now, but they have no equity (or negative equity) in their homes. If the average move-cycle is 10 years, then we're talking about people who purchased their homes in 2005 (the top of the market). For those that purchased or refinanced since 2004, it is likely they will have to bring money to closing to sell their home. Thus, nearly half the pool of historically typical buyers have a condition stopping them from buying a home today. 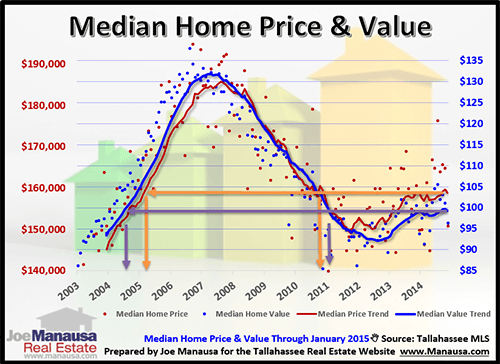 Values in Tallahassee are on the rise, and as they move higher, they will continue to free-up more and more of the group identified above to go ahead and sell and then buy. The following information was derived from both the Tallahassee MLS as well as the Leon County Property Appraiser. Ultimately, a new home's construction costs are 91% higher than a comparably sized existing home. This difference between new and used is at its widest margin since I began recording it many years ago. Builder Beware: Measure twice and cut once if you are considering a speculative home right now. The following graph shows annual population growth (green shaded area) and building permits (yellow columns), both measured on the left vertical axis. 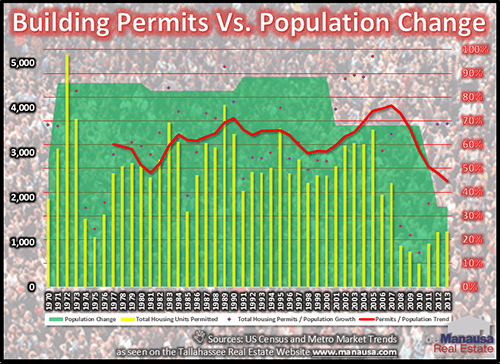 The red line shows the ratio of building permits to population growth, and it soared from 2000 through 2007. After experiencing rising population levels for the previous decade, the falling population came as a shock to those who had been continuing forward for a growing economy and population base. 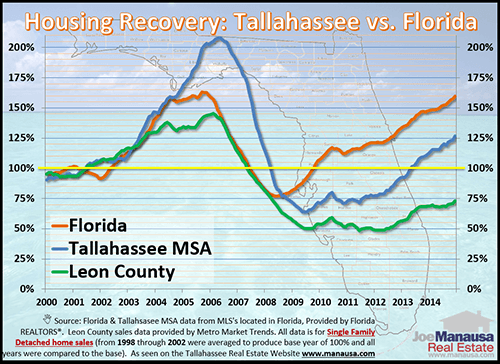 As of 2011, the direction of the recovery for Florida and our surroundind markets moved markedly higher, whereas the Leon County market declined before just recently starting to rise. I suspect this is due to job growth in Florida, and State job reductions in Tallahassee. Our elected leaders are fixing the State, but Tallahassee is where much of the fixing is taking place. Low mortgage interest rates have helped the housing market recover, and there will be no more good news on interest rates. Even if rates fell (again) for several more years, the market has become accustomed to low rates and I do not think this would spur any real growth. But rising mortgage interest rates are an entirely different story. 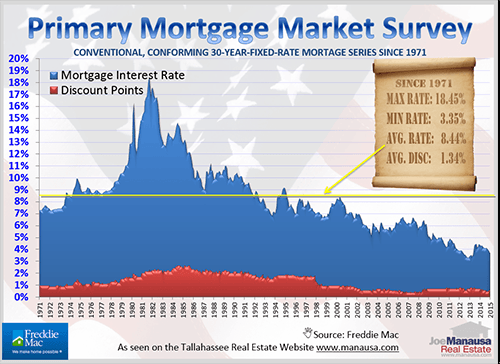 The graph above shows mortgage interest rates going back to 1971, and our current rate (3.67%) is less than one-half of the fifty year average. Imagine if rates rose to 8% (still lower than average). How do you think the market would react? 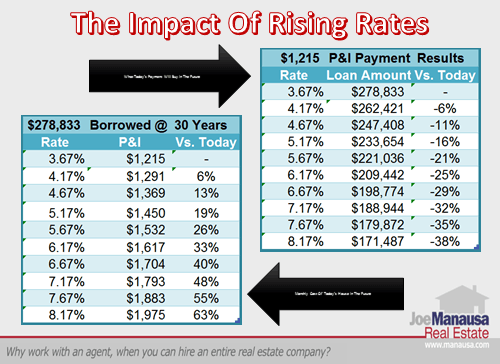 The table on the right shows that a buyer comfortable buying the average new home today (with a loan of $278,833) would have a monthly principal and interest payment of $1,215. If rates rose to 8.17% (still below average), that buyer would have $100K less to spend on a home if he wanted to keep his payment the same. Would rising rates impact home sellers and the size of their buyer pools? You bet! If a buyer wanted to purchase the same new home, his payment would rise 63%! Would rising interest rates impact the sale of new homes? Of course. How about the impact of rising interest rates on high end homes? 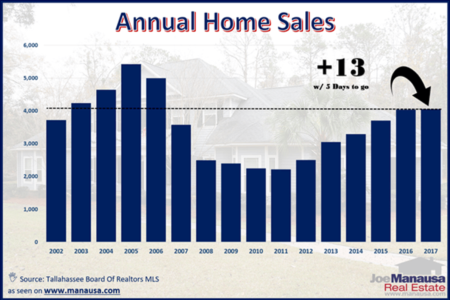 If you look at the incredible rise of home sales above $400,000 in Tallahassee, you should quickly realize that it is NOT our local economy spurring these sales. First there were loan products that were not prudent, now there is low interest rates that will not last forever. When interest rates rise, who will buy these high end homes? Our population has grown 43% since 1991. To put the growth of high end homes into perspective, the Tallahassee real estate market averaged 25 home sales each year in the 1990s for homes priced over $400,000. The decade ending in 2010 averaged 237 per year, an 837% rise! I know we didn’t see an equivalent rise in population or jobs, so I’m concerned that affordability due to low mortgage interest rates has pulled people into this market. You have to wonder to whom will they sell their homes if rates go up to 8.5%, 10%, 12%, etc. The relative supply of homes is declining (improving), but we still have more sellers than buyers. Currently, the one-year trend of months of supply rests at 7.1 months worth of inventory. This is a great improvement, but it is still too much. When we look at this by price-range, we see that the distribution is not even across the board. For the most part, relative supply looks good below $300,000. But once we get to $300K and higher, the market is well out of balance, with not enough buyers for the sellers that want to be rid of their homes (and builders who want to build new ones in this price range). Digging further shows that just as not all price ranges are the same, nor are all areas in Tallahassee. We consider 6.0 months of supply a balanced market (market equilibrium, where sellers and buyers trade on equal and fair footing). When relative supply levels fall below 6.0, we call this a seller's market and high levels of appreciation should be expected. When relative supply levels move above 6.0, we call this a buyer's market and buyer's control the negotiations (if sellers want to sell). Right now, NE Tallahassee (52% of all sales are in the NE) looks good up to $300K, but the other areas are not doing nearly as well. If you were thinking about building a home, where would you put it? What price would you seek? As I was speaking to builders, I felt it wise to discuss the changing roles of key players in the market. For example, with whom do you think the single family detached homebuilder competes? In other words, who else wants to "SUPPLY" homes to the market? Other Home Builders (not so secret) - Yes it's true. Builders compete with other builders to supply the market, so this source is not so secret. Lender REO & Asset Managers (shadow inventory) - There are still thousands of homes in the shadow inventory (3000 estimated remaining), and they come onto the market as asset managers think they can get them sold. Sounds a lot like "SUPPLY" right? It's easy for builders to mistakenly pull the trigger on new homes when supply levels fall, but they should first check to see the current estimated state of the shadow inventory of homes. Multi-Family -> The concept of consumption in real estate is something that many reporting agencies miss. Is there a “for sale” market and a “for rent” market? 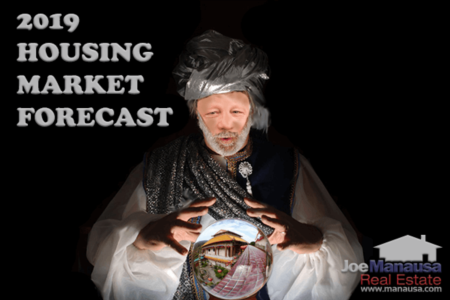 – No, there is a residential market. Some “for sale” units become “for rent” when they fail to sell. Some “for rent” units become “for sale” when they fail to rent. The market doesn't change until a unit is consumed by an end user – A large investor buying up units does not change supply and demand in the market … it merely changes ownership of some of the units. Multi Family are housing units that compete for a single family detached homebuilder's consumer when you factor in the real estate food chain and the concept of consumption. 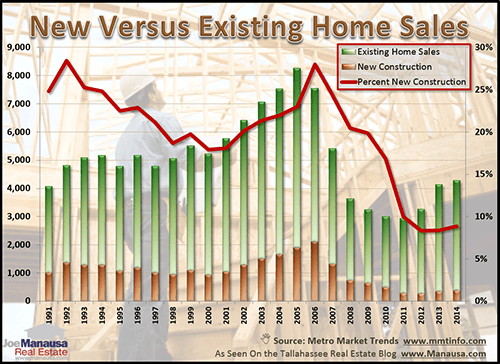 The following graph shows a hot new trend in construction in Tallahassee that likely has gone either unnoticed by single family detached home builders, or they have seen it and not realized its impact on their business. The total number of housing permits are shown in the layered graph, while simultaneously the population change is plotted as a purple line. The orange dots measure the ratio of Multi-family (MF) permits to all housing permits, and the orange line measures the eight year trend of this ratio. This is the highest rate of multi-family permits recorded in all of the past 45+ years, and it more than doubles the rate see in the 1990s. Why does this matter? Because homebuilders are waiting for the market to return to normal (but it already has). Welcome to the new normal. We are now building MF units, and the greatest likelihood is that single family units will be built at rates far lower than what has been seen since before the 1970s. 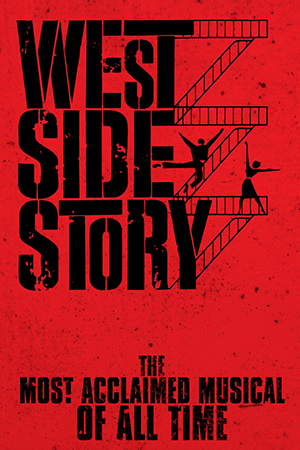 And this is why the "West Side Story" is so important. What would you think if I told you that a builder is about to build 4,500 single family homes, condominiums, and townhouses on the west side of Tallahassee? As a reminder, here's what supply and demand looks like in Tallahassee. But this is all of Tallahassee. What do you think it looks like on the West side? Do you see a need for 4,500 homes? If you were a lender, would you finance one of these properties? Well, this is where we look at consumption, the real estate food chain, and the real connection between multi-family and single family in the whole real estate ecosystem. Student housing appears to be changing in most major college towns … from “Main Street” investors to “Wall Street” investors. This is certainly true in Tallahassee. By my count, roughly 4,500 units will be up and running by year’s end. Students will flock to these; if not … Wall Street investors have deep(er) pockets and the ability to incentivize students if demand is lacking. So you have to ask yourself … “from where will these students come? Will this be Tallahassee's West Side Story? Unless student populations grow at a faster than expected rate, vacancies will soar for older rental properties on the west side. The inventory of “for sale” homes on the west side of town will skyrocket. Prices will decline dramatically, likely below half the cost of replacement. Low prices will pull some buyers from other parts of town, as non-students return to neighborhoods that had (fairly) recently been overtaken by students. The demand for NE Tallahassee has driven prices higher, so NW Tallahassee will slowly become the relief valve for the hottest segment of the market (currently 51% of home sales are in the NE … this will slowly decline). If 4,500 is truly the magic number, it represents more than a year’s worth of supply for all price levels at today’s current rate of sales. Of course, the number is likely just over half of this (as it's not like we were expecting zero building for MF in Tallahassee). But this could still take many years to absorb. The outlook for real estate is not nearly as clear as in decades past, we are entering into uncharted territory. Tallahassee is moving into a compression market, where homes in the middle want to appreciate while those at the top and bottom do not. Median homes are in high demand and cannot be produced in most areas (demand exceeds supply). This indicates a seller’s market with high appreciation. Tallahassee is in a glut market for student rentals (low end) which will ultimately serve as future supply for median homes. 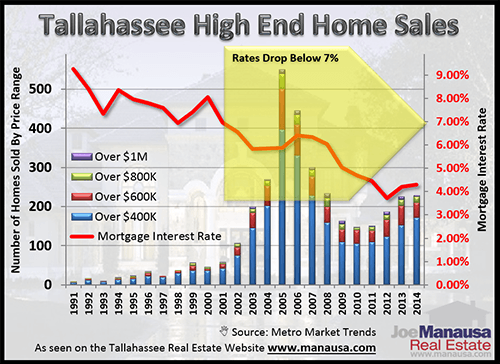 Tallahassee is also in a glut market at the high end, and when interest rates return to normal, it is likely that the relative supply of $1M homes will exceed 10 years. 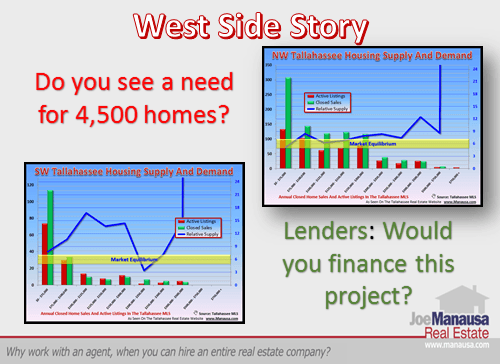 If you are a local builder, take the time to do a real tactical analysis of the Tallahassee real estate market. There are opportunities to exploit and threats to avoid, and you can navigate through them with a sound plan built upon solid information.